University Recreation has opened a fully equipped small group training and personal training studio that will now allow a private studio space for training sessions with accredited personal trainers. The new UREC Training studio, located on the first floor of the HPER building, was created by fully renovating a racquetball court. Supporting equipment includes: TRX suspension trainers, Rip trainers, ViPR’s, kettlebells, plyometric boxes, training ropes, a powerlifting rack, and more. Small Group Training classes this fall will take place in the new studio, and will utilize a variety of trendy fitness equipment in a challenging and fun environment. 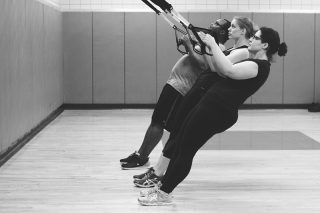 The UREC certified personal training staff will take participants on the ultimate fitness experience while providing motivation, tips and progression toward participant goals. Complimentary demo classes will be held at the scheduled class times from Monday, Sept. 12 – Thursday, Sept. 15. Classes are offered at various times throughout the day to fit a variety of schedules, and are conveniently located at the both HPER and UREC Fitness Centers. Class offerings include UREC RazorFitness, Foam Roll Yoga and Inversion and Arm Balance Yoga. Each of the eight week classes meet twice a week from Sept. 19­ – Nov. 15. The cost for students to participate in the entire eight week section is $25. For all other UREC membership types the cost will be $35. Participants can register for Small Group Training at the UREC Main Office in HPER 225, at the UREC Fitness Center in the Arkansas Union or online at https://urecmembers.uark.edu. The Fall 2016 Small Group Training schedule, registration packet and more information for all session dates and times can be found at urec.uark.edu.